DNA is often referred to as the blueprint for life, however scientists have for the first time discovered a microbe that uses two different translations of the DNA code at random. This unexpected finding breaks what was thought to be a universal rule, since the proteins from this microbe cannot be fully predicted from the DNA sequence. Researchers from the Milner Centre for Evolution at the University of Bath and the Max-Planck Institute for Biophysical Chemistry in Göttingen, Germany have published their findings in the journal Current Biology. All organisms receive genetic information from their parents which tell the cells how to make proteins—the molecules that do the chemistry in our bodies. 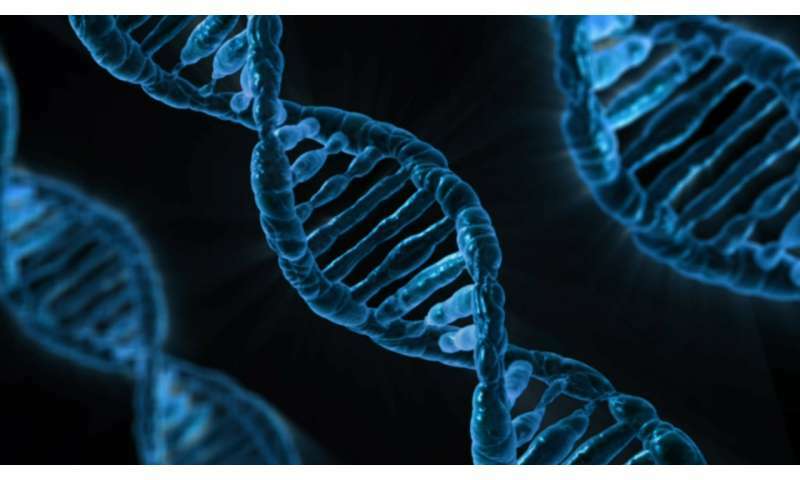 This genetic information comprises DNA molecules made up of a sequence of four chemical bases represented by the letters A, T, C and G; the genetic code dictates to the cell which sequence of amino acids to join together to form each protein given the underlying sequence in the DNA. In a similar way that "dot dot dot" in morse code translates as S, so too the genetic code is read in blocks of three bases (codons) to translate to one amino acid. It was originally thought that any given codon always results in the same amino acid—just as dot dot dot always means S in morse code. GGA in the DNA for example translates as the amino acid glycine. However a collaboration between Dr. Stefanie Mühlhausen and Professor Laurence Hurst at the Milner Centre for Evolution at the University of Bath, and Martin Kollmar and colleagues at the Max-Planck Institute for Biophysical Chemistry in Göttingen, Germany have now described the first—and unexpected—exception to this rule in a natural code. The group examined an unusual group of yeasts in which some species have evolved an unusual non-universal code. While humans (and just about everything else) translate the codon CTG as the amino acid leucine, some of the species of yeast instead translate this as the amino acid serine whilst others translate it as alanine. This is odd enough in itself. But the team was even more surprised to find one species, Ascoidea asiatica, randomly translated this codon as serine or leucine. Every time this codon is translated the cell tosses a chemical coin: heads for leucine, tails it's serine. Laurence Hurst, Professor of Evolutionary Genetics and Director of the Milner Centre for Evolution at the University of Bath, said: "This is the first time we've seen this in any species. "We were surprised to find that about 50 per cent of the time that CTG is translated as serine, the remainder of the time it is leucine. "The last rule of genetics codes, that translation is deterministic, has been broken. This makes this genome unique—you cannot work out the proteins if you know the DNA." To understand how this happens—how this coin-toss mechanism is physically manifested—the team investigated molecules called tRNAs—which act as translators that recognise the codons and bring together the amino acids to make a protein chain. Dr. Martin Kollmar, from the Max-Planck Institute for Biophysical Chemistry in Göttingen said: "We found that Ascoidea asiatica, is unusual in having two sorts of tRNAs for CTG—one which bridges with leucine and one which bridges with serine. "So when CTG comes to be translated, it randomly picks one of the two tRNAs and hence randomly picks between serine and leucine." Dr. Stefanie Mühlhausen from The Milner Centre for Evolution at the University of Bath added: "Swapping a serine for leucine could cause serious problems in a protein as they have quite different properties—serine is often found on the surface of the protein whereas leucine is hydrophobic and often buried inside the protein. "We looked at how this strange yeast copes with this randomness and found that A. asiatica has evolved to use the CTG codon very rarely and especially avoids key parts of proteins." The researchers estimate that the random encoding is 100 million years old, but other closely related species evolved to lose this potentially problematic trait. Dr. Martin Kollmar said: "It's unclear why A. asiatica should have retained this stochastic encoding for so long. Perhaps there are rare occasions when this sort of randomness can be beneficial." Oh please don't insult our intelligence. We really don't need the morse code analogy here; its really not difficult to understand the simple concept of translation. We really don't need the morse code analogy here; its really not difficult to understand the simple concept of translation. @humy-- I won't downvote your comment although it's certainly not very welcoming to individuals who might be attempting to learn new things on this site but who haven't yet become as expert as you are. No one should be discouraged from venturing into new areas and the more that what they already know can be appealed to in order to build new understanding, the better. Analogy is an excellent method for doing this, and this is an article written by a science writer attempting to translate the actual article in Current Biology for a popular audience after all, not specialists. Perhaps there are biologists unfamiliar with morse code.